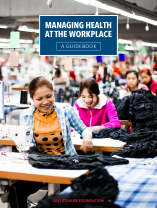 The Evidence Project has produced a package of resources with support from the Levi Strauss Foundation to provide companies, supplier factories, and other organizations the information and tools to improve their management of workplace and women’s health. The resources developed are based on real experience in factories, on industry research and evidence, and on practical actions that work. Managing Health at the Workplace: A Guidebook answers questions many workplace managers have asked: Why worker health? Why should I have to deal with one more non-business issue? And what more can be done about health, in any case? A Scorecard for self-assessment that provides suggested indicators that can be integrated into a factory’s goals or key performance indicators for health. The goal is expand the access to quality health services for women and men workers and to help companies achieve important business benefits as a result. Browse other Workplace Health resources.